The dramatic focal point of UNESCO World Heritage-listed Fiordland National Park, Milford Sound is a popular natural wonder on New Zealand’s South Island. Whether you want to cruise the fjord, soar overhead in a helicopter, or hike through the mountains, these are your options for Milton Sound tours from Queenstown. Those short on time can take in the highlights on a half-day tour, with options including a combination flight and cruise with round-trip flights from Queenstown landing in the heart of Fiordland National Park. After taking in views from above, set out to cruise Milton Sound, enjoying photo stops at Mitre Peak, Bowen Falls, and Mount Pembroke. Maximize your time by opting for a tour with hotel pickup and drop-off, and pre-book activities in advance. Full-day tours mean you can spend more time exploring and soak up the scenery on the spectacular drive from Queenstown. Enjoy panoramic views and ample photo opportunities aboard a glass-roofed coach or comfortable minivan as you drive the Milford Road, passing the Remarkables mountain range, Lake Wakatipu, Lake Te Anau, and the Homer Tunnel. Most full-day tours include a range of activities, such as a boat cruise or scenic plane flight. The sweeping glaciers, rugged mountains, and thundering waterfalls of Milford Sound are dazzling from the air, and helicopter tours offer the ultimate aerial view. Opt for a round-trip private or small-group flight from Queenstown; swoop over the Southern Alps, Lake Wakatipu, and Tasman Sea; and touch down on Tukuko Glacier, Otago's Glacier Basin, or one of the west coast beaches. Milford Sound is located on the southwest coast of New Zealand’s South Island, about 178 miles (287 kilometers) northwest of Queenstown. The quickest way to get to Milford Sound is by plane, while by road, it’s at least a 4-hour journey each way. Day tours from Queenstown typically last between 10 and 13 hours. Be sure to bring your camera, wear comfortable walking shoes, and dress according to the weather—it can get chilly out at sea. Full-day tours differ in their inclusions, but many include hotel pickup, lunch, and sometimes extra activities. Milford Sound is one of New Zealand’s most visited natural wonders and this full-day tour allows you to experience the UNESCO-listed landscapes from all angles. Soar over the mountains and lakes of the Fiordland National Park on a small-plane flight; enjoy a 2-hour cruise across Milford Sound; zip along the Dart River on a jet boat; and get close to nature on a forest hike. Milford Sound is one of the star attractions of New Zealand’s South Island, but its remote location makes it tricky to visit on a day tour. This full-day tour from Queenstown is ideal for those short on time, combining a thrilling drive along the famous Milford Road, a scenic cruise around the UNESCO-listed fjord, and the chance to spot seals, dolphins and penguins. Cruise Milford Sound and explore New Zealand’s Fiordland on a full-day trip from Queenstown by luxury coach. You’ll see some of the South Island’s most dramatic scenery through the glass roof of the coach, then cruise past towering waterfalls and seal colonies to the Tasman Sea, choosing between open decks and cabins that are comfortable in any weather. With pickup and drop-off at selected hotels in Queenstown, this Milford Sound trip is a spectacular day of scenery and wildlife in Fiordland National Park. Travel to the Tasman Sea on a 2-hour Milford Sound cruise aboard the ‘Milford Mariner’ or ‘Milford Wanderer.’ Pass by the world-renowned Mitre Peak and drift alongside rushing waterfalls as you search for wildlife including New Zealand fur seals, dolphins and Fiordland-crested penguins. An onboard nature specialist provides expert commentary. Hotel pickup and drop-off are available from Milford Sound, Queenstown and Te Anau by luxury coach. Experience the landscape of Milford Sound and Fjordland National Park on mountain roadways, a 1-hour, 45-minute nature cruise, and a sightseeing flight from Milford Sound to Queenstown. Along the way you’ll see some of the South Island's most remarkable scenery, such as Eglinton Valley, the Mirror Lakes, Stirling Falls, and Sutherland Falls, and Milford Sound is ideal for spotting wildlife. This 9-hour combination tour includes transport by glass-roof coach, catamaran boat, and plane, as well as lunch, refreshments, and hotel pickup and drop-off. See the sheer cliffs of Milford Sound from the air and water on a half-day tour from Queenstown by sightseeing plane and catamaran. Fly over Fjordland National Park, part of a UNESCO-listed landscape, then touch down at Milford Sound for a cruise with drinks and lunch (for the midday departure) served on board. This tour is perfect for photography and wildlife watching, and hotel pickup and drop-off from Queenstown hotels is included. The UNESCO-listed landscapes of Milford Sound are even more spectacular from above. Take to the skies on a 1-hour and 20-minute round-trip flight from Queenstown; spot natural wonders such as Mitre Peak and Bowen Falls from the air; and enjoy unbeatable aerial views of the mountains, lakes and fjords of the Fiordland National Park. Board the ‘Milford Mariner’ for a Milford Sound overnight cruise, including round-trip transport by luxury coach from Queenstown with the option to return by air. You’ll journey the entire length of Milford Sound, cruising all the way to the Tasman Sea before sleeping in your private single or twin-share en suite cabin in sheltered Harrison Cove. Hear informative onboard commentary by a nature guide, and enjoy a three-course buffet dinner, breakfast and use of provided kayaks. Upgrade for a 35-minute scenic flight back to Queenstown. Discover the highlights of the South Island on a 3-day semi-independent tour, round-trip from Queenstown. Travel by glass-roof coach to Te Anau, gateway to the UNESCO-listed Fiordland, where you’ll take a 2-hour boat cruise on Milford Sound — surrounded by rainforest, waterfalls and glacier-carved valleys. Enjoy a full day at your leisure in charming Dunedin, followed by a train journey by Taieri Gorge Railway to Pukerangi. You’ll have your choice of standard or superior accommodation, including breakfast, in Te Anau and Dunedin. A Milford Sound cruise, scenic drive and return helicopter ride complete this extraordinary day trip from Queenstown. See the UNESCO-listed Fiordland National Park by land, sea and air, starting with vivid landscapes viewed through your glass-roof luxury coach along Milford Road. The 2-hour cruise covers the entire length of Milford Sound to the Tasman Sea, while the 40-minute helicopter flight takes you over Mt Tutoko and Lake Wakatipu, with a brief landing on Donne Glacier (weather permitting). Discover the best of the South Island on a land, sea, and sky tour from Queenstown to Milford Sound. 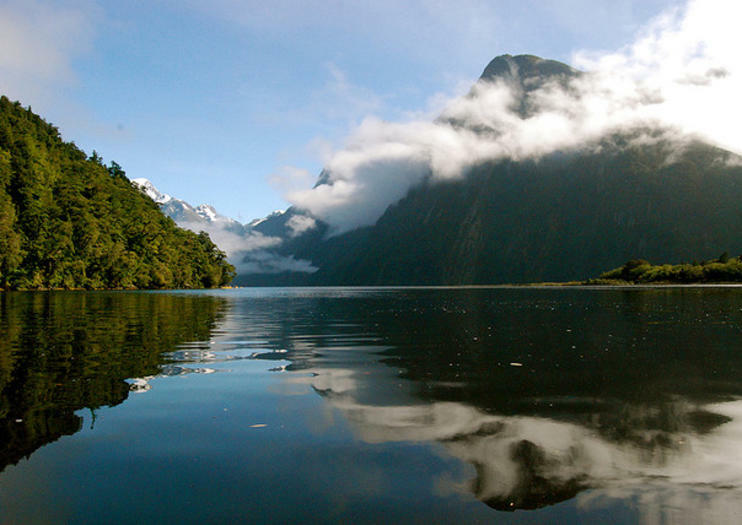 Travel through the UNESCO-listed Fiordland National Park, including Mitre Peak, by coach. Then board a cruise through Milford Sound while enjoying a delicious buffet lunch. A scenic flight over the Southern Alps back to Queenstown completes this full-day tour offering a bird’s-eye view from the air that will take your breath away. This 4-hour tour gets you quickly to Milford Sound from Queenstown the most scenic way — by helicopter. Swap the roadways for the skies, soaring over the Southern Alps then landing at Fiordland National Park while your pilot-guide provides commentary along the way. After an informative cruise on Milford Sound, with plenty of photo ops of waterfalls and Mitre Peak, you're treated to a second landing on a snow-capped peak. Book on a shared helicopter, or upgrade your experience to a private charter exclusive to your group. Board a Milford Sound cruise and ride a vintage steamship across Lake Wakatipu to Walter Peak High Country Farm on this Queenstown Super Saver. You’ll take each tour on two separate days, soaking up the breathtaking alpine landscapes of the South Island. First, spot marine life as your experienced skipper navigates the serene waters of the UNESCO-listed Fiordland. The next day, enjoy typical New Zealand hospitality at a rural farm with wool spinning, sheep sheering and either morning or afternoon tea. This 2-hour helicopter tour flies you from Queenstown to Fiordland National Park and boasts unbeatable views from above. A professional pilot points out of the ice-capped Southern Alps, including glaciated lakes and forested valleys, before descending to Milford Sound. Make two landings — on a secluded beach and an alpine glacier — with time to explore and get the perfect photo op. Book your seat on a shared helicopter, or upgrade your experience to a private charter exclusive to your group. Soar above the scenery of Milford Sound and the glaciers on this helicopter tour from Queenstown. Get views of the sound, the glaciers, forests, and the Alps, culminating with a touchdown on a glacier. National park fees and round-trip hotel transportation included. See the spectacular landscape of Fjordland National Park from the air with a 1-hour sightseeing flight above Milford Sound from Queenstown. Take off over Otago and fly past Skippers Canyon, the Donne glacier, and the dramatic coastal fjords, including Sutherland Falls. This 1-hour Milford Sound flight includes round-trip transport from your Queenstown hotel.